The Acousticom 2 is a compact, simple to use detector for Wireless / WiFi Radio Frequency Radiation and Microwave Radiation (200MHz – 8GHz) It uses color coded LED’s which correlate to measurement ranges to assess the RF exposure in your environment. The Acousticom 2 also has a sound signature analysis which helps identify Wireless / WiFi / RF Sources. 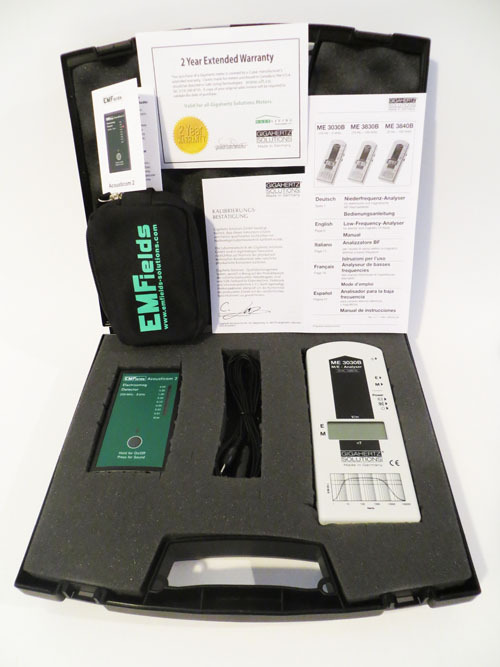 The Acousticom 2 is a simple to use RF detector which quickly identifies peak RF exposure to Radio Frequency Radiation. It detects the power density of frequencies between 200MHz to 8GHz. 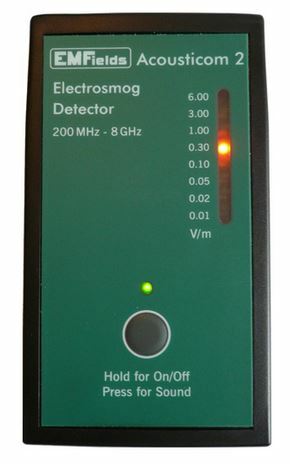 This detector also has a sound signal analysis feature which aids in source identification and mitigation. Select the downloads tab for sample sounds of Common Sources found in most homes. Color coded LED’s which identify peak power density.